Clearly the title of this blog post is false, but the meaning behind the equation could not be more true. The term 1+1=4 is often said around the studio and most commonly refers to our desire to collaborate with other artists. Huge benefits come with working in such a fashion. The notion that the whole is greater than the sum of its parts is not new by any means, but I will argue that it is an incredibly rare and even potentially controversial notion in today’s creative society. The idea that anyone can build something that will last on its own, (and I mean last longer than it takes you to skim through the rest of this blog post), is naive, juvenile, and quite honestly, stupid. Working together is one of humanity’s strongest selling points, yet far too often we in the creative industry think of ourselves as renaissance men/ladies, able to do it all. Well I’m sorry to break it to you, but you’re not a solo act… you are only as talented as the team of artists you entrust to help bring your creative vision to life. So what’s the downside? Why don’t more freelancers collaborate on bigger projects, promote one another and try to build something larger than themselves? The first and arguably largest hurdle is admitting that you can’t do everything yourself. Becoming self aware and accepting your limitations as an artist will help you identify the critical roles that need to be filled in your business. I’m absolute rubbish at applying makeup, which is why I work with a Makeup Artist like Maggie Kleinman. I also know my limitations when dealing with large scale post- production needs, so I often collaborate with digital artists like Chris Dowsett and Jason Feiler who handle that sort of heavy lifting daily. Admitting these weaknesses to oneself doesn’t make you less of an artist or less proficient in your medium, it makes you more of a specialist and forces you to be more innovative. And let’s be real: not everyone can be a “James Franco” and do it all! #1. It sets a tone of professionalism that is so often lost when people barter or trade services. Creatives tend to show up on time, properly dressed and actually excited to work when there’s money on the line. #2. Creatives these days are so jaded with people asking them for free work that when you offer to pay them actual money it provides a sense of accomplishment and reassurance that what they’re doing is valuable. This feeling means the world to creatives of all kinds and I’m speaking from extensive experience. #3. I’ve found that the freelancers who understand the value of their work and refuse to work in trade are often the best, and I’ll do whatever needs to be done to work with the best. Even something as little as $75 to help write and edit some copy for your new website can go a long way in keeping your creative colleagues stoked to work with you. Right Maddie? The next hurdle should be the easiest one to get over but it seems to be getting harder and harder: Where do you find these talented freelancers? 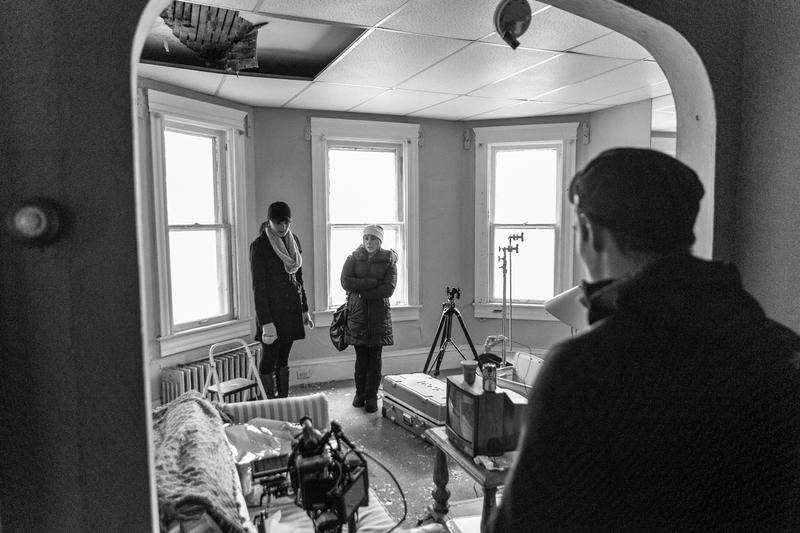 There are some free services like the Greater Cleveland Film Commission that has an amazing list of local crew here in Cleveland and other services like Wonderful Machine, in which artists pay a fee to be included in their network. But the one resource that I’ve found works best is just asking around. The freelance creative community is very small and gets even smaller when giving referrals. I’ve worked with dozens and dozens of freelancers in my 10+ years as a photographer, but I truly only ever refer a handful of them to my clients. Making a referral is the highest compliment that one creative can give to another. You’re entrusting a client’s needs to another creative and the experience that client has will reflect back upon your business either positively or negatively. Since I pride myself on only working with the best, you can believe that if I refer you to another creative they’re the best of the best. If you’re in need of one of the freelancers that I collaborate with regularly here at the studio or have worked with in the past, don’t hesitate to reach out… Info@JamesDouglas.com. I’ll hook you up with them as quickly as I possibly can. 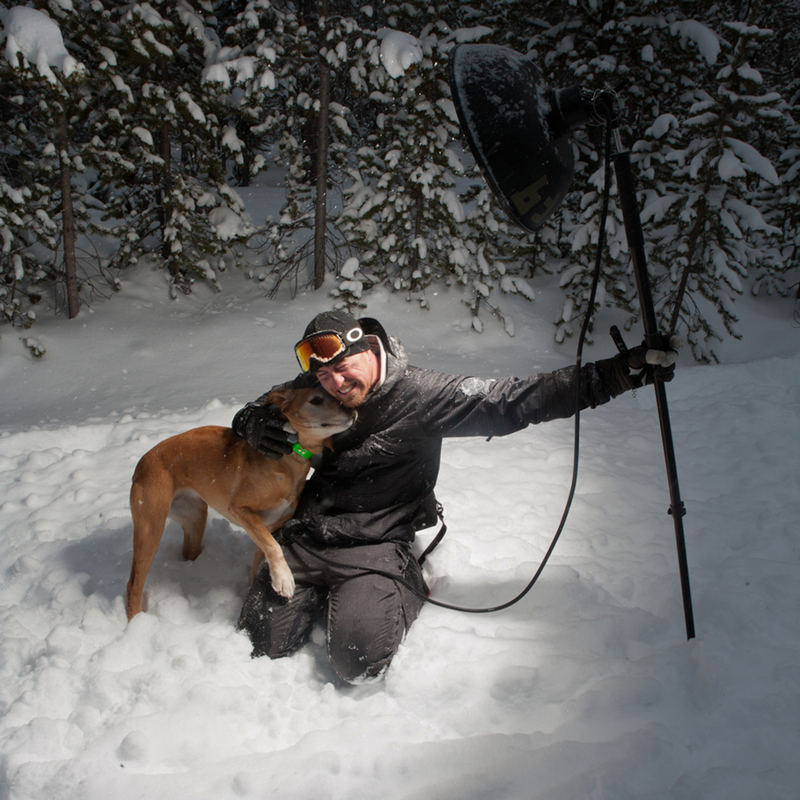 Above: My digital artist guru and often much needed creative therapist Chris Dowsett getting some quality puppy lovin on set in Montana. That’s enough with the hurdles; let’s talk about some of the benefits! The term “collaboration” is defined as “a working practice whereby individuals work together for a common purpose and achieve shared goals.” I can think of no other word in the English language that so effectively encapsulates how I like to work. 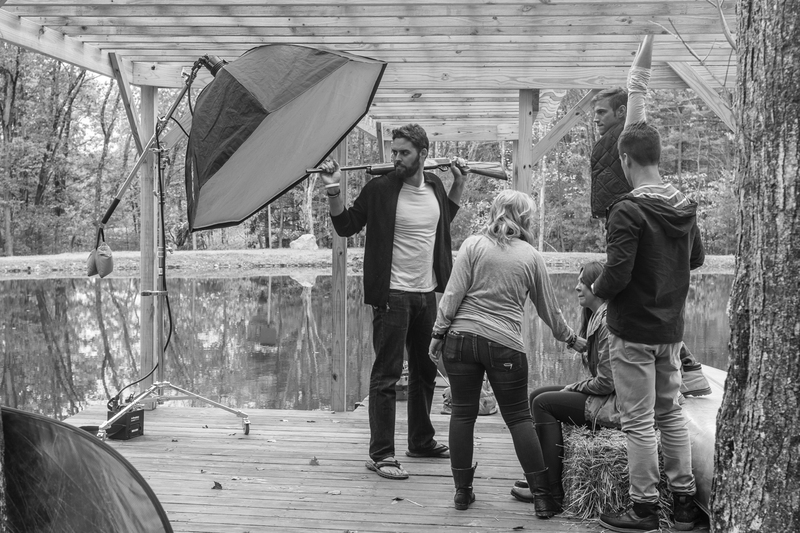 Collaboration has always been and continues to be one of the biggest factors for me when creating compelling work. Some of the images I’ve made in my life would look very different if I hadn’t allowed the artists I work with to give their two cents or shoot down some God-awful idea I had in the middle of the night. We have a lot of creative discussions over beers and under the chandelier here and they’re nearly always about how to develop a new idea or solve a client’s problem. They’ll get heated and tensions will rise when creatives defend their ideas, but when you have the respect of your peers it always ends with the best idea winning out. (Think Gladiator only with more coffee and plaid shirts.) I often seek out the advice of my friends who are not involved in the creative industry to be sure any idea that comes out of the studio is well rounded and thought through from every angle. I make sure that my friends and colleagues poke as many holes in an idea or project so that when the time comes to pitch we’ve already patched them up, together. Above: Anderson Varejao letting Maggie know it’s time to start wearing heels on set. Another amazing benefit is friends… and not the kind of friends that were forced upon you in college by which dorm you were assigned to. I mean the kind of friends that you actually want and seek out on your own. Your network will expand immensely once you start reaching out and working with other freelancers, a great deal of whom I’ve found will become great friends over time. That’s why I’m always so proud to say that I’ve met some truly talented people in my professional career. We don’t have the traditional cubicle companions, so it’s very important to develop relationships within our “workplace” even if that particular “workplace” just happens to be the world-class patio at Nano Brew. 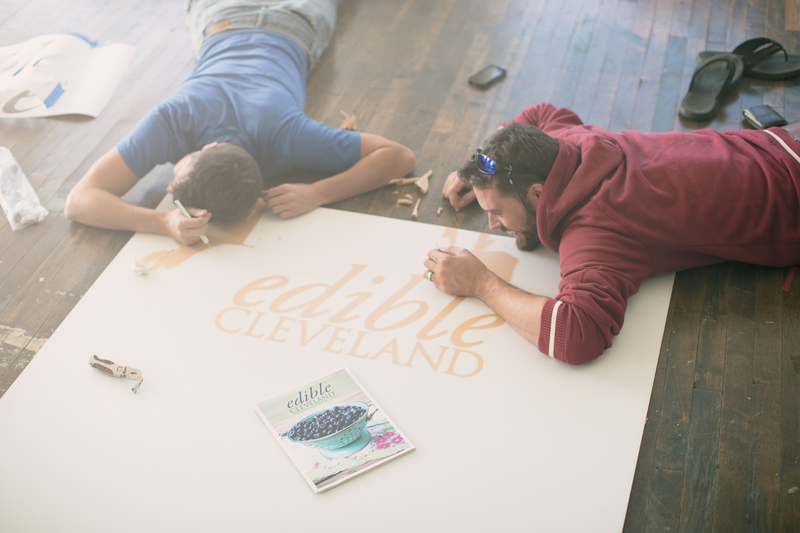 Above: The Hub Art Factory owner and tape cutting enthusiast Tim Carmany reaching his limit for Edible Cleveland. 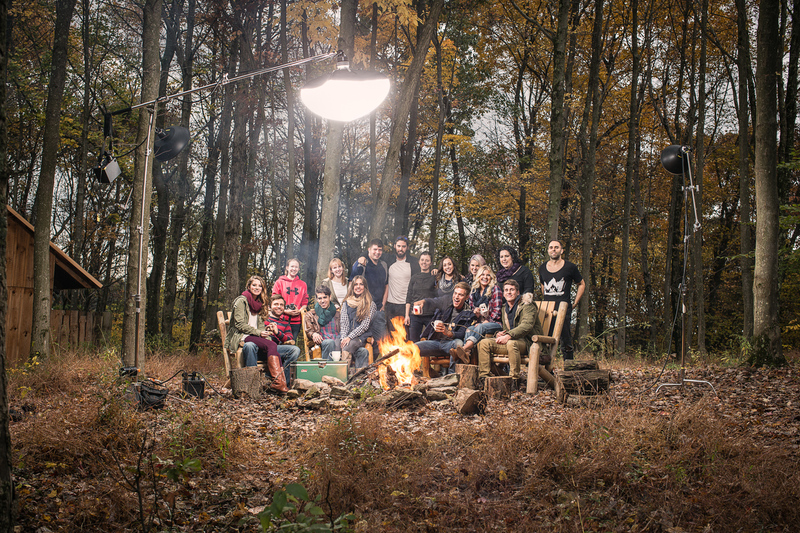 Above: Just a fraction of the TJDS family we’ve managed to pull together. Loved the article and your approach to you business – while I am not a creative, i am certain you & your work family would be way fun to work with! We’re a hoot… and thanks for taking the time to check us out!!! I came here after this post was re-posted on Phoblographer. Just wanted to say that this is a really nice piece. Collaboration is a really powerful way of working, and can yield really great creative results. Thanks for taking the time to read the post and I’m glad you dig it. I can’t really think of any project I’ve worked on with others that I thought I could have done better myself… that’s why I’ll always do everything I can to work with other creatives from all disciplines. I’ve experienced this first hand with James countless times. I totally agree. Collaboration has been in my blood since I first held a camera. Teaming up with the right creatives makes for some amazing work that would have existed if it were to come from one individual. In many of our collaborations it seemed to end up with a messy studio but amazing work. That’s where we connected from day one. We don’t fear the complex. In the end the creative wins. Great post!